Lutron is committed to providing best-in-class products and solutions that offer superior performance, with world-class service and support. Whether it’s the seamless integration of Lutron light and shade control products, or integration with third-party products and systems, Lutron solutions present the reliability and convenient control required for today’s demanding applications. With products ranging from dimmers and lighting control systems, to sensors and window systems, Lutron solutions are designed to provide reliable integration across all of our product platforms. Clear Connect RF Technology is Lutron’s latest advancement of our highly reliable RF technology that ensures seamless communication between our system components. Lutron RF products and systems operate on a quiet frequency band that is essentially free of interference. A dedicated network ensures communication between systems devices are reliably delivered, and group commands ensure a smooth, simultaneous system response. 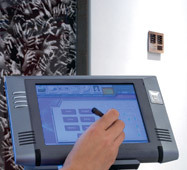 Clear Connect has been deployed in Lutron’s next-generation RF systems, including Energi TriPak, Radio Powr Savr sensors, GRAFIK Eye QS, and Sivoia QS Wireless. Lutron works with many 3rd party manufacturers to ensure that our systems integrate reliably with other products. Lutron provides documentation, product, and technical support to many manufacturers to ensure that our systems work with a wide variety of 3rd party systems.